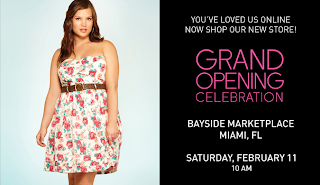 The Frugalista Fatshionista: Torrid FINALLY opening in Miami!!!! For all my local fatshionistas!!!! I'd love to work here if it weren't so far for a daily commute (I'm in Westchester, for all you locals, and this is downtown...) but I am THRILLED to finally be able to GO to Torrid and try things on, shop in person, eeeeeeeeek!!!!!!!!!!! !